McDonald spoke on 1540 AM WADK radio with Blenheim-Newport, a senior living community in Newport, Rhode Island about how senior citizens can easily stay in touch with their family members and leave an educational legacy for future generations. Before I started my own business as a digital media strategist, I used to be a journalist at The Boston Globe. My passion for understanding people’s stories has evolved into helping businesses engage with everyday people. I love making business owners’ lives easier with technology, tools, and processes that make them more efficient and effective. I founded a local network called Newport Interactive Marketers, which is entering its eighth year. NIM is for business owners, solopreneurs, big companies and nonprofits who want to better understand how marketing works today and the best way they can connect with their customers & audiences. NIM hosts monthly events that focus on networking, followed by a presentation given by an expert who works in a digital marketing or tech-related field. Past presentations have focused on topics such as social media trends, measuring Google and other web analytics, and explaining what a valuable website should really cost. There’s an important focus on education at NIM, whether you’re doing the work yourself and have questions or making sure the people you’ve hired are doing the best job they can. Today on Senior Matters—and thanks to Blenheim for having me—I’d love to share how seniors can use technology. Stay with me because there are so many wonderful things you can do! Like anything there are risks: you don’t drive a car without learning how to do it, for example. Same here and there are classes available if you’ve never even touched a computer before. Benchmark offers classes & the senior centers on [Aquidneck] island do too. I’m a big believer in aging brings wisdom, so I know there are folks out there, with the right support, who can benefit tremendously from some of the tools we’ll talk about today. Did you know the fastest growing demo on Facebook is seniors? Why do you think that is? 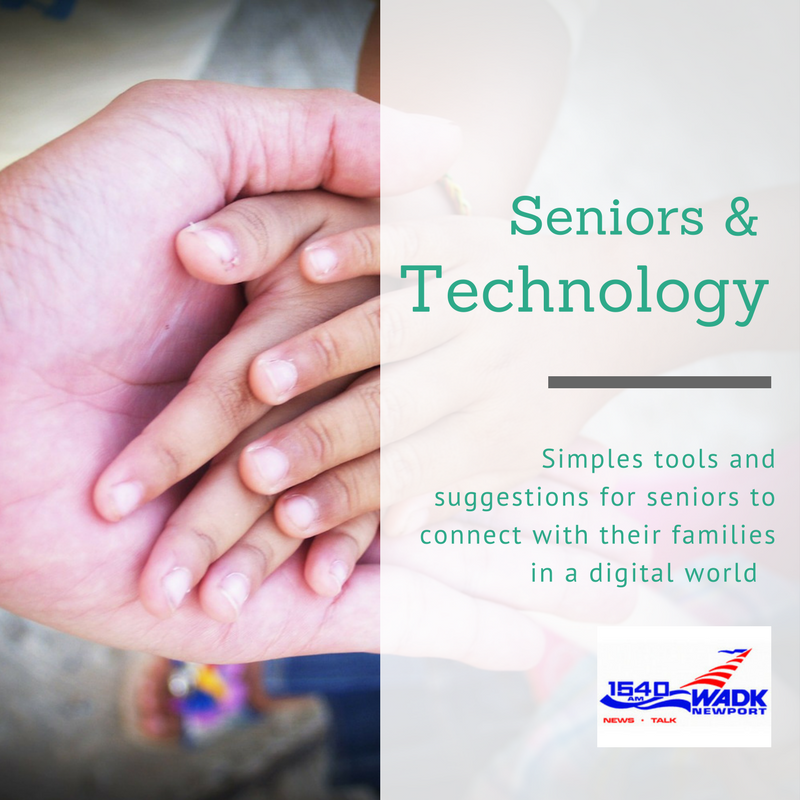 Connecting with grandchildren, although many of them may be on other social media as well. My mom just got a tablet last year for Christmas. She had not even touched a computer for decades and kept saying she didn’t want one—now she’s pinning chicken coops on Pinterest, sending emails, booking flights. It’s so funny to me because she didn’t have an email for so long, I’m always surprised when I get an email from her! It’s so nice to be able to send her pictures of my daughter and know she can see them. And everyone in my family loves it. It’s especially important as her first grandchild just went off to college. More specifically, I’d like to mention a few online tools that make everyone’s life easier, make those precious moments and capture them as they happen. Here’s my recommendation—mention these tools to the tech support expert in your family. Think high school age or even college. Get them to research it and set it up. Have you seen the Apple ad that ran last year that the kid always looked removed from all the activities going on when the family was together? And then he shows a video he made of the weekend? SUPER idea! My niece did one of the last time we were all together and had it done before the weekend was over. It’s touching and funny and completely captures the spirit of the weekend! There’s a site called Doodle, Doodle.com that allows everyone to put in their schedule so you can see when everyone is available or NOT. So for Thanksgiving, let’s say not everyone can be together. Wouldn’t it be fun to pick a time over the weekend when everyone can jump on a video call together? It’s not the same as in-person togetherness, but it’s important to do the best we can. Maybe teleporting will happen someday, but for now, we can connect so much better than 20 years ago. We recently had a death in the family, and it’s always a reminder of how precious moments like those are. So let’s say you have everyone lined up for a video call … what tool would be best? Google Hangouts, now YouTube Live, might be a good option. Another “mission” I have going on is to record moments from family history. Have you heard of StoryCorps on NPR? A family member records an oral history with an older person … or any person I believe. What a great idea! In our case, we’ve sort of skipped a generation in that it’s worked out my daughter’s grandmother lived in London England through the Depression and World War II. She had some amazing stories about being an ambulance driver through the blacked-out streets of London during bombing raids. I think they called them beetle-bombs because of the noise they made. Sadly, my mother-in-law passed before my daughter was born. But I did do some interviews and recordings with her siblings who are still in London. I’m really doing her history reports for her! We also have family in South Africa who are quite elderly and it’s fascinating to get that perspective of history – both good and bad. And you could do the same thing. You don’t even need anyone to interview you. You could have help setting up a YouTube channel and sit in front of the computer, phone, or iPad and tell your story. Bring some props and talk about meaningful moments in your life. Give your grandchildren or your friends’ grandkids some perspective! In some ways, I’d like to challenge our listeners to do so. Kids can’t even conceptualize what your life was like. Think about it … what was food prep like? The best idea I have is from Downton Abbey. If we don’t share what we’ve experienced, we can’t expect anyone to understand it and your descendants deeply want to know—but be lively & interesting! Pretend you’re on Fox News or Charlie Rose. Don’t be afraid of technology – ask for help! A complaint is an “uncommunicated request.” There are classes and support. Learn the ropes! A big helper is someone in high school or college or even younger. Get that digital native to reverse mentor you! What a benefit to you and confidence boost to them! Don’t rely on them to do all the work. Give them ideas, spark the inspiration. Mention YouTube Live, mention Doodle. Suggest everyone get on a video call over Thanksgiving weekend and connect as many in your family as you can. It’s actually pretty easy. 1 tip: use Google Chrome!! Don’t worry, the kids will know what that is. Take the challenge: Share your wisdom and experiences with your family and friends.